At Linwood Resort, each of our 14 modern and spacious cabins offer a spectacular view of Lake Osakis. 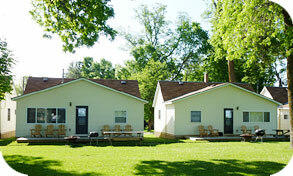 All cabins are air conditioned and have Satellite TV. Your rental also includes the use of 16-foot Lund boat and life vests. Motor rental available. Also included in each cabin: double sleep sofas or futons to accommodate extra people, modern bathroom and kitchen facilities, dishes, pots and pans and bed linens. Please bring your own bath and dish towels and soaps (we have soft water). Find the one that's just right for your vacation. Holiday Weekends require 3 night minimum! Visitor pass - $5.00 per person - Visitor hours from 9:00 a.m. to 10:00 p.m. - Please inform your guests before they arrive of our rules and fees. Non-refundable deposit due within 10 days of making reservation. Cancelled check is your receipt. Balance of rent due on arrival. Beginning in 2014, our pricing reflects a 3% cash discount. All deposits and payments made by credit or debit card will have 3% added to the total. No refunds will be given if we are unable to fill the cabin or campsites for the same time frame. If cabin or campsite is re-rented for the same time frame a refund will be given minus 10% of deposit paid. Reserved marine equipment including lifts must be paid for the duration of reservation regardless of use. We cannot guarantee the weather. 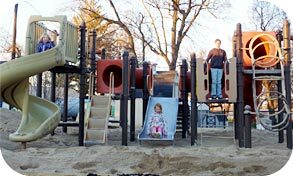 The kids love our playground. 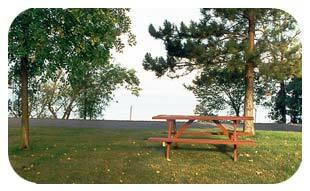 Have a picnic overlooking the lake.